The Darling is Hannah Musgrave's story, told emotionally and convincingly years later by Hannah herself. A political radical and member of the Weather Underground, Hannah has fled America to West Africa, where she and her Liberian husband become friends and colleagues of Charles Taylor, the notorious warlord and now ex-president of Liberia. When Taylor leaves for the United States in an effort to escape embezzlement charges, he's immediately placed in prison. Hannah's encounter with Taylor in America ultimately triggers a series of events whose momentum catches Hannah's family in its grip and forces her to make a heartrending choice. 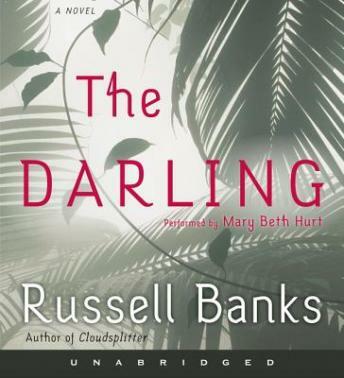 Set in Liberia and the United States from 1975 through 1991, The Darling is a political/historical thriller -- reminiscent of Graham Greene and Joseph Conrad -- that explodes the genre, raising serious philosophical questions about terrorism, political violence, and the clash of races and cultures. This tale was a fascinating one, and the book worth a read. But the narration was what made this a 5 Star audiobook. The narrator was simply phenomenal. Give this book a listen. You’ll not regret it. A real surprise. Excellent storytelling and superb narration. One of the better audiobooks I’ve found.